Rocket builders in China are slated to augment their Long March family of boosters this year and in 2016. According to Chinese news services, the country will soon fly their Long March 6 – likely in the middle of this year. Additionally, China's Long March 7 and Long March 5 rockets are to make their first flights next year, according to Tan Yonghua, president of China's Academy of Aerospace Propulsion Technology, as reported in the state-run China Daily. The Long March 6 rocket will utilize a newly developed 120 ton thrust engine. That booster is a high-speed response launch vehicle capable of placing a payload of about 1 metric ton into a sun-synchronous orbit at a height of 700 kilometers. Tan said that the new engine has been under development by the academy since 2000 and makes use of liquid oxygen and kerosene as its propellants – billed by China as more "eco-friendly" than current engines. With the new engine, the Long March 5, Tan said, will have a payload capacity of 25 metric tons for low-Earth orbits, or 14 tons for geostationary transfer orbits. The Long March 7 will be capable of sending payloads of 13.5 tons into low Earth orbits and of 5.5 tons into sun-synchronous orbits, Tan said. 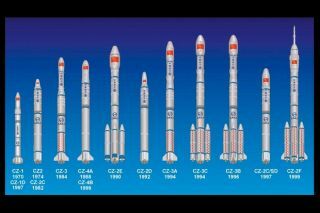 The Long March 2 and Long March 3 rocket families, the backbones of Chinese launches, are headed for retirement within the next 10 years, with the Long March 7 and Long March 5 becoming the pillars of China's space program, Tao Gang, general manager of the Tianjin Long March Launch Vehicle Manufacturing Company Ltd. told China Daily late last year. Next year's maiden flight of the Long March 5, a heavy-lift rocket, is the booster that is to place the Tiangong 2 space laboratory into Earth orbit in 2016 for visits by Chinese space crews. The Tiangong space labs are viewed as building blocks to gain technical and operational expertise to construct a larger space station in the 2020s. Long March 7 engine test. In other Chinese space news, the state-run Xinhua news agency reported today that the Chang'e 4 lunar probe is to be launched before 2020. According to the State Administration of Science, Technology and Industry for National Defense (SASTIND) Chang'e 4 "will pilot a program that uses private investment from individuals and enterprises for the first time, a move aimed at accelerating aerospace innovation, cutting production costs and promoting military-civilian relationships." Xinhua reports that Chang'e 4 — a backup probe for Chang'e 3 that put lander and rover on the moon in 2013 — will be given a "new mission" that will be decided after further study. Leonard David has been reporting on the space industry for more than five decades. He is former director of research for the National Commission on Space and is co-author of Buzz Aldrin's 2013 book "Mission to Mars – My Vision for Space Exploration" published by National Geographic with a new updated paperback version to be released in May. Follow us @Spacedotcom, Facebook or Google+.